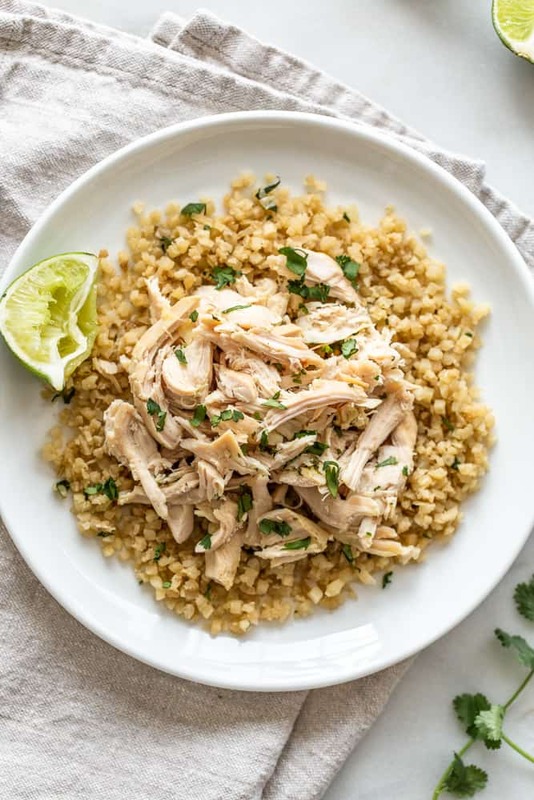 Easy Shredded Cilantro Lime Chicken + Cauliflower Rice recipe for a quick and savory paleo dinner or a perfect addition to your weekly meal prep! You know what I love? Recipes that require minimal prep and come together on their own without much effort. 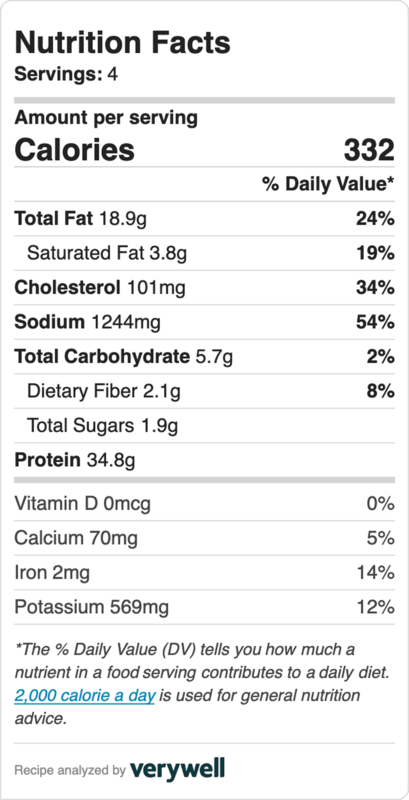 That, my friends, is why I’m giving you this juicy, shredded chicken dinner. 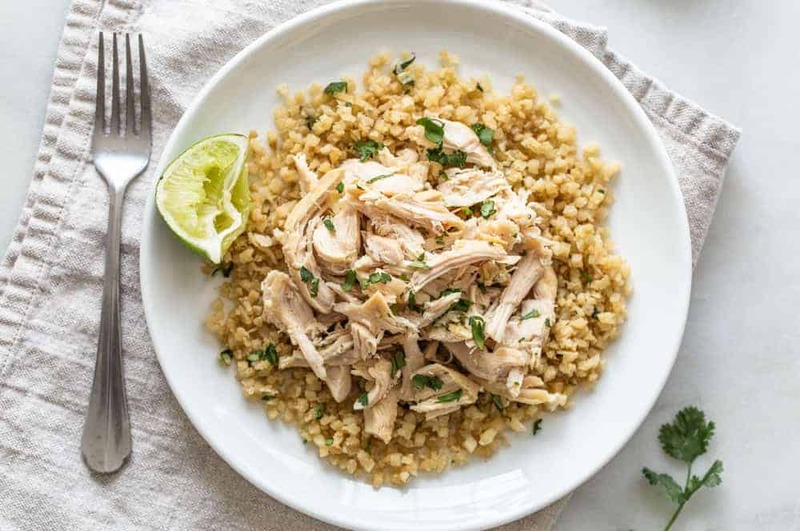 The chicken is flavored with fresh cilantro and lime and served over a delicious over a bed of cauliflower rice. It’s one of those easy, 15 minute prep meals that makes for a tasty weeknight meal or the perfect addition to your meal prep. This shredded chicken is also super versatile. You can put it in tacos, enchiladas, mix it in with some pasta salad or even in a veggie breakfast hash. The possibilities are endless, so go on and get creative it with! So let’s make weeknights THAT much easier with this Shredded Cilantro Lime Chicken dinner + Cauliflower Rice! Add the chicken breasts to a bowl or plastic bag and add the olive oil, cilantro, lime juice, salt, and pepper. Let the chicken marinate in the fridge for 30 minutes. This is something you can do in the morning so that night when you’re ready to cook it you can pop it in the oven and be done. Preheat the oven to 400F. Remove the chicken from the marinade and lay it on a rimmed baking sheet lined with parchment paper. Bake in the preheated oven for 25 minutes, or until the internal temperature reaches 160F. 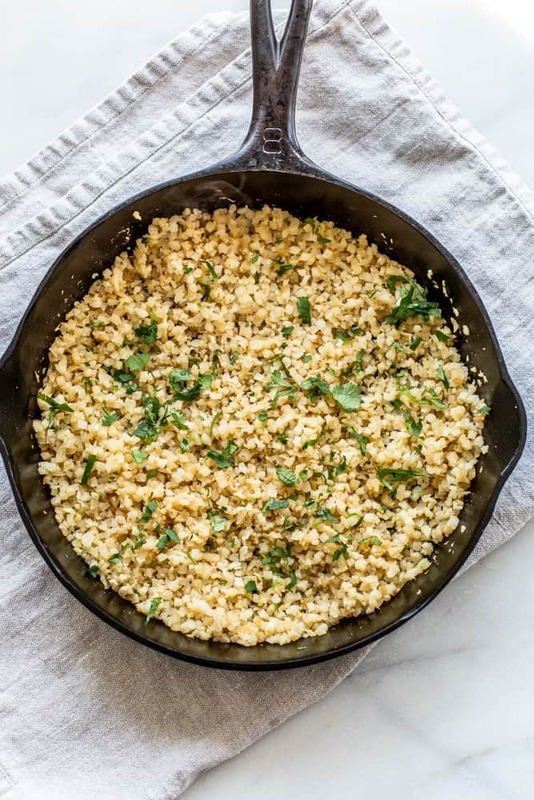 While the chicken cools so you can shred it, make the cauliflower rice. If you’re not using pre-riced cauliflower, go ahead and rice it with a box grater or food processor. Heat the olive oil in a large skillet over medium heat. Add the cauliflower and cook for 5-8 minutes until it starts to turn slightly golden brown. Add the coconut aminos or soy sauce, lime juice, garlic powder, and salt. Mix well and cook for 2 additional minutes. Shred the chicken with two forks and serve over a bed of cauliflower rice. Top with more fresh cilantro. Add the chicken breasts to a bowl or plastic bag and add the olive oil, cilantro, lime juice, salt, and pepper. Let the chicken marinate in the fridge for 30 minutes. Remove the chicken from the marinade and lay it on a baking sheet with a rim. Bake in the preheated oven for 25 minutes, or until the internal temperature reaches 160F. While the chicken cools so you can shred it, make the cauliflower rice. If you’re not using pre-riced cauliflower, go ahead and rice it with a box grater or food processor. Add the cauliflower and cook for 5-8 minutes until it starts to turn slightly golden brown. Add the coconut aminos or soy sauce, lime juice, garlic powder, and salt. Mix well and cook for 2 additional minutes. Shred the chicken with two forks and serve over a bed of cauliflower rice. Top with more fresh cilantro. BIG thank you to my friend Allie from Miss Allie’s Kitchen for creating this delicious recipe and taking these gorgeous images for us!! I love her work and couldn’t be more excited she’s creating some tasty dishes to share here too!